While Disney’s The Nutcracker and the Four Realms might leave you wanting more as far as the plot is concerned, it is definitely a beautiful-looking film with the 4K Ultra HD and Blu-ray release doing justice to the visual presentation. I was provided a copy of The Nutcracker and the Four Realms Blu-ray for review. I bought the 4K UHD for a better comparison. The opinions are my own. Disney seems to be all about making live-action adaptations of classic animated movies these days. And considering the impressive box office results, I’m not surprised. However, unlike Beauty and the Beast, Cinderella, and the upcoming Aladdin, The Nutcracker and the Four Realms didn’t have a proper animated feature from Disney for the studio to work with. So, of course, this allowed the team to take more creative liberties with the content without having to worry about certain fans complaining about it not sticking enough to the animated version. The Nutcracker and the Four Realms is a combination of The Nutcracker and the Mouse King by E.T.A. Hoffman and Tchaikovsky’s iconic ballet. The movie is visually stunning, but the end product is another unfortunate example of “style-over-substance” in big-budget Hollywood fare. However, having said that, I don’t mean certain viewers won’t enjoy this film. It is just I was left wanting more from the overall narrative. As far as the plot is concerned, Clara Stahlbaum (Mackenzie Foy) and her siblings Louise (Ellie Bamber) and Fritz (Tom Sweet) are preparing for their first Christmas since their mother’s death. On Christmas Eve, their father Benjamin (Matthew Macfadyen) gives each child a gift from their mother. Clara’s gift is a locked, silver egg. When the family goes to attend a Christmas party at Drosselmeyer’s (Morgan Freeman) residence, who also happens to be Clara’s godfather, the young girl asks him about her mother and the gift. She ends up in The Four Realms, a magical world her mother was the queen of. Of course, Clara is the princess. She begins an adventure to unite the Realms with help from Captain Phillip Hoffman (Jayden Fowora-Knight), the Nutcracker. The Sugar Plum Fairy (Keira Knightley), Mother Ginger (Helen Mirren), Hawthorne (Eugenio Derbez), and Shiver (Richard E. Grant) serve as the reagents for each Realm. The story does seem to be inspired by elements seen in similar fantasy films including The Wizard of Oz, The Chronicles of Narnia, Alice in Wonderland, and such. I did like Clara as a character. She is a mechanical genius and a good tactician. The movie does a commendable job of showcasing a very capable and determined young woman without being too preachy about it. She also isn’t entangled in an unnecessary romance. Coming to the home release, The Nutcracker and the Four Realms 4K Blu-ray offers stunning video quality. I recommend you watch this film in the 2160p UHD release to really enjoy the visuals and intricate details. The 1080p Blu-ray also boasts impressive visual presentation, but lacks the finesse featured in the UHD release. From the skin texture to hair strands, everything has a sharpness and clarity to it. If only such attention was given to the script, too. Sigh! The Blu-ray features the DTS-HD Master Audio 7.1 lossless soundtrack while the UHD release has the Dolby Atmos soundtrack. I didn’t notice much of a difference between the two, but the Dolby Atmos did offer a slightly more immersive experience than the DTS, especially during the battle and dance sequences. The extra content can be found on The Nutcracker and the Four Realms Blu-ray disc. You also get a Movies Anywhere digital copy code. On Pointe: A Conversation with Misty Copeland (1080p, 4:36) – Professional ballerina Misty Copeland discusses her role as the Ballerina Princess. She talks about the differences and similarities between dance and acting as well as her overall experience working on this film. Unwrapping The Nutcracker and the Four Realms (1080p, 7:08) – We see the cast and crew talk about the set design, the costumes, and such. Music Video (1080p, 4:23) – “Fall On Me” Performed by Andrea Bocelli Featuring Matteo Bocelli. Music Video (1080p, 4:06) – “The Nutcracker Suite” performed by Lang Lang. 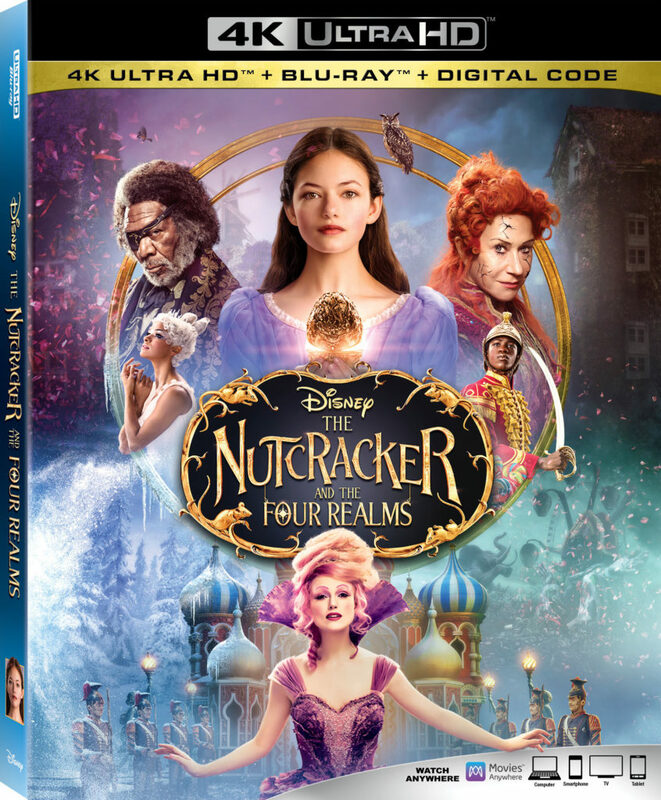 All in all, The Nutcracker and the Four Realms Blu-ray, 4K, DVD home release can offer a good time for the entire family with some stunning visuals and enjoyable music. However, the overall story is lacking. Have you watched The Nutcracker and the Four Realms? Let us know.